Patrick Troughton’s Doctor – Victoriana – dark fairy tales – rewriting the whole of time and space… No, it’s not the latest Doctor Who from Steven Moffat, but a fabulous story first broadcast forty-six years ago yesterday and, appropriately for John Stuart Mill’s birthday, one of the most blazingly Liberal of all Doctor Who stories: a Dalek Faust. Last Christmas, I wrote two guest pieces about it for my friend Nick Campbell’s blog: here’s the full version of what I sent him, not one of my usual style of reviews but a series of questions and answers – and spoilers. Episode 1 of Doctor Who – The Evil of the Daleks was first broadcast on 20th May, 1967, and though it was repeated the following year, the BBC later junked all but one of its seven episodes. That means I’ve never seen six-sevenths of it, and only came to it on audio cassette at the age of twenty, a quarter of a century later. And yet ever since then it’s been one of my favourite stories across the whole fifty years – reliably at my number 2 spot – with terrific performances all round, the Daleks as you’ve never heard them before but influencing many Doctor Who adventures since, and above all a compelling script from David Whitaker, the series’ finest writer of the 1960s. 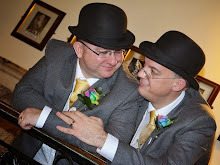 So when it approached time for my friend Nick and his friend Sarah to cover it on their blog Campbell & Hadley’s Recorder, I asked if I might take him up on one of the ‘guest pieces’ he’s occasionally prodded me to write. The Doctor (Patrick Troughton) and his friend Jamie (Frazer Hines) have seen off the threat of the Faceless Ones to Gatwick Airport in Swinging 1966, but their usual departure for another time and place is prevented when the TARDIS is stolen and driven off in a lorry. Using the Doctor’s own cleverness against him, a trail of clues and crooks lead them to an antique shop with a secret and back into Victorian times… Who is behind it all? Timid but driven scientist Edward Waterfield? His big-guest-star-in-a-bigger-beard colleague Theodore Maxtible (Marius Goring), financier, scientific and alchemical dilettante and steampunk Goldfinger? Their peculiar house guests, or bewildered daughters? All right, so you’ll have guessed it’s mostly the Daleks, who’ve taken advantage of Waterfield and Maxtible’s captivatingly insane Nineteenth Century time experiments to capture the Doctor and his friend for experiments of their own… But as the climax approaches on the Dalek planet of Skaro and the Doctor faces up to the Emperor Dalek at last, who is really trying to deceive who? [A clue: almost everybody.] Mashing up Victoriana and modern science fiction decades before it was fashionable, this is utterly compelling – a marvellous morality tale in sci-fi trappings from its inspired fantasy science through a country house mystery to a civil war and a powerfully Liberal moral that champions questioning individuals over rigid authority and the impulse to destroy. The opening has an intriguing mystery to it – the spy, the clue, the transmitter as hearing aid and someone listening in… Is it ‘Revenge of the Chameleons’? Fortunately not. Mr Waterfield almost has too much personality, not too little, ostentatiously Victorian, moral, full of self-loathing and unnerving all at the same time. Unusually for Doctor Who, there’s a sharply observed class divide here too: Hall’s a small-time working class crook who, even given extra money, still has his principles; posh, ambitious businessman Perry protests that he won’t do anything “dicey” only after Waterfield’s prevented the greedy weasel from stealing his suppliers (and he creeps in later to pinch a customer). So who’s the more crooked one…? The Doctor’s very modelled on Sherlock Holmes to start with: mistrusting the easy clue; analysing the cigarettes; spotting the matchbook; the too-short study… All used to trap him, of course, but I wonder where it comes from – Whitaker’s character notes for Troughton’s Doctor, or making us have the Victorian period in mind from the start? That’s a sign, too, like them being labelled “Devils”, that this is a going to be a very different sort of Dalek story. In theory in Doctor Who, Mr Maxtible should be right when he tries to regard them as “different people. Alien,” but here more than any other time they’re less physical monsters than a force of spiritual evil, fading from their first scene like Victorian ghosts. It’s a brilliant mystery – funny, intricate, and deadly underneath, from Molly the maid assuming our heroes are plastered to the Daleks’ aggressive Weight-watchers. One bit of writing doesn’t convince, though: Chekhov’s Portrait is a clumsier bit of exposition than most, particularly when we’re told about it twice. And I know we’re meant to feel for Ruth, caught between her obsessive father and her schizophrenic fiancé, but I just find Brigit Forsyth very cold. Possibly because when, way back in my teens, I worked in a restaurant, she was the most horrible customer we ever had and made the waitresses cry. Was it Maxtible who thought up “Leatherman”? I ask because much of the early part of Episode 3 is him getting his “man” from London to flex his muscles while he and a Dalek eye him up. But Episode 3 and, slightly less so, 4 would have been very visual, with much less pace or meat (other than Kemel) to them than the terrific openers. Part of the problem is that Pat is so blatantly on holiday, with only a few little scenes of the Doctor giving a DVD commentary on the plot, which are rather ahead of their time (the Doctor and a Dalek! Watching humans! On television! How postmodern). Toby’s plot, particularly, could easily be discarded, with the whole ‘the violent one looks to do some burglary but is exterminated’ end already used for Kennedy. Jamie in a temper is quite raw – it’s not just that the Doctor’s talking about him behind his back, but has gone off with two new gentleman boyfriends. With his heavy emphasis on “There’s no-one I’d rather have with me” when he finds his own rebound guy, it comes across very much as hurt that the Doctor’s dumped him just as he thought they were finally an item. And yet he’s learnt from the Doctor and applied it, too: in The Macra Terror, the Doctor laid the groundwork for so much of this story, telling people not to do as they’re told. Jamie believed that, and now his loyalty to the Doctor’s ideals makes him refuse to do what the Doctor himself says. No, not questions that are evil – well, I hope not, anyway. I've just relistened to those last three episodes for the first time in years (only the second time ever, too). 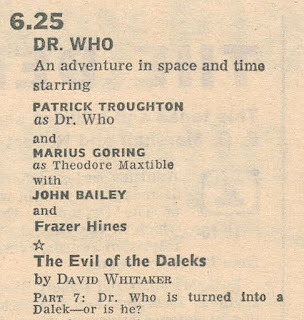 I'd completely forgotten that episode six twist (that the Doctor had been tricked). That's probably my favourite moment – how about you? 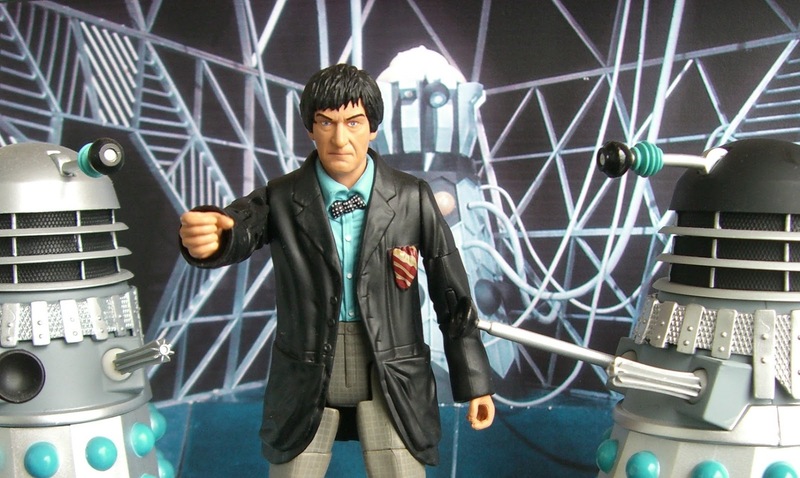 The Episode 6 cliffhanger of the Doctor confronting the Emperor is probably my favourite, too! For a lot of reasons – the bluff and counter-bluff of it all, the Doctor being intelligent, afraid, ruthless, but above all defiant against the biggest bully and the Universe, the fantastic sight of that bully itself… With even a bonus innuendo. Crucially, though, it gets to the heart of me because the Doctor expounding on the Human Factor versus the Dalek Factor is so absolutely Liberal, freedom against conformity and hate, all leading into how just asking questions brings down the Daleks in the final episode. So I will tell you that (spoilers!) it’s coming up sometime in my year-long countdown of Doctor Who – 50 Great Scenes. You’ll have to wait to find out what chart position it’s reached. The reason I asked if I might join in with you on The Evil of the Daleks is that it is simply one of my absolute favourites. Sarah talked about the cassettes last week; well, I listened to this one most of all, and of that curious but brilliant all-Troughton early ’90s selection, I loved them all to start with, yet two have since dipped a little for me while two continue to soar – perhaps it’s because this and The Macra Terror seem such close thematic bedfellows. And in seven episodes, there are many more than one great scenes. Two other crucial ones that come to mind are, appropriately, mirrors: the Doctor and the nice old man both being scary; the Daleks being friendly. There’s a great moment where the Doctor’s satisfied at the close of the experiment and Waterfield, sick with horror, tries to kill him – and the Doctor gives a hint of just what an appalling thing he’s planning. Later, perhaps only Pat’s Doctor could get away with gently telling Victoria he’d let them all die. So it’s no wonder Jamie’s the voice of the viewer in saying the Doctor’s turned wrong. Contrast that, then, with the endearing ‘child’ Daleks playing, particularly Omega with his incredibly deep voice (and note that the ruthless Doctor sends his innocent children off to war). Of all Doctor Who stories, this has a fair claim to being the ‘ultimate’ one, and it was clearly designed that way – not just that it’s so well-done, full of atmosphere, characters and ideas, but that you could imagine it working as a Doctor Who film. Because it’s about adventures throughout time and space, almost all single Who stories would be lacking something in a standalone film – but this is structured almost uniquely through present, past and future / an alien world overlapping. The only thing that’s weird about this perfection is that the adventure is following the TARDIS, rather than aboard it. Here we are back on Skaro, blowing it up. Is this an affectionate goodbye to the Hartnell era, do you think, or a slightly aggressive wipe of the blackboard (better metaphors are welcome). I think it’s really striking out in a different direction to William Hartnell’s Dalek stories, which intriguingly raised the stakes and broadened the canvas with each return – and adds a dash of TV21’s Dalek strips (in the form of a rebellion among the Daleks, and ‘nicer’ Daleks) long before Russell T Davies did them in Bad Wolf. 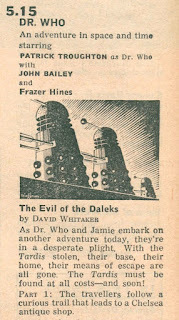 David Whitaker has a subtly different conception of the Daleks to Terry Nation; in some ways Nation’s is more powerful, with the starkness of space Nazis, but Whitaker makes them more insidious, corrupters, our bad angels – most of all here, as I’ve said, a force of spiritual evil for Doctor Who’s Faust. Though it does have curious (or not so curious, given that Whitaker was script editor behind both) parallels with both The Daleks and The Dalek Invasion of Earth – it’s the final end of the Daleks, in their city, again, and makes explicit the mash-up of different time periods that was a subtext in the invasion (technically the future / feels like the 1960s the viewers knew, smashed / but essentially the iconography of ‘what if the Nazis had won in the 1940s?’). I don’t think it’s really about the Hartnell era, for all that – Troughton is very distinct and his own Doctor here, and Whitaker is pitting the Doctor and the Daleks against each other in their essences rather than physically. A lot of good work seems to be done with playing with Dalek voices, even having an untreated one in the form of Maxtible. Do you think this story would succeed with different audio, or cheaper visuals…? It’s a brilliant script, but obviously that almost everything seems to work helps – I can think of other terrific scripts hated by fans largely because they’re not delivered nearly so well (Paradise Towers, for example). Here, the actors and the atmosphere are top-notch, and imagining it with, say, the Day of the Daleks Dalek voices doesn’t bear thinking about. Despite not being able to see most of it, knowing that some of it was filmed Grim’s Dyke has always been a bit of a thrill, as my Nana and Grandad lived near Old Redding when I was a boy, so I’d play just across the road from Maxtible’s house when visiting. Do you or have you ever found the Daleks scary, and why? Do you like the Daleks? And if you do or don't particularly, do you think it affects your enjoyment of this story? I’ve always found the Daleks powerful – in design and concept, as space Nazis in individual tanks, the embodiment of war and hate. Certainly the best Who monster… Though, unlike some, I think they were more tense or thrilling than nightmarish. Some monsters literally did give me nightmares as a boy, but, oddly, the scene from Genesis of the Daleks that did wasn’t one with Daleks in it. They have a fantastic vocal and insidious presence here, only really becoming a physical threat (despite the odd extermination!) at the close of Episode 6. It’s odd – I can never make up my mind whether effectively making them malevolent spirits displays them at their essence or very out of character. Either way, for me this is their best story. Do you think Terry Nation could have written this story (I did wonder if the inclusion of a countdown was deliberate homage by Whitaker)? Do you think it was inevitable that this story – the final destruction of the Daleks – would be written? I don’t think Terry Nation could possibly have written this story, but then I don’t think he wanted to. He banned Emperors, didn’t he, and he hated Daleks being ‘sent up’ (except when he did it, and far more dumbly than “Dizzy Daleks”). 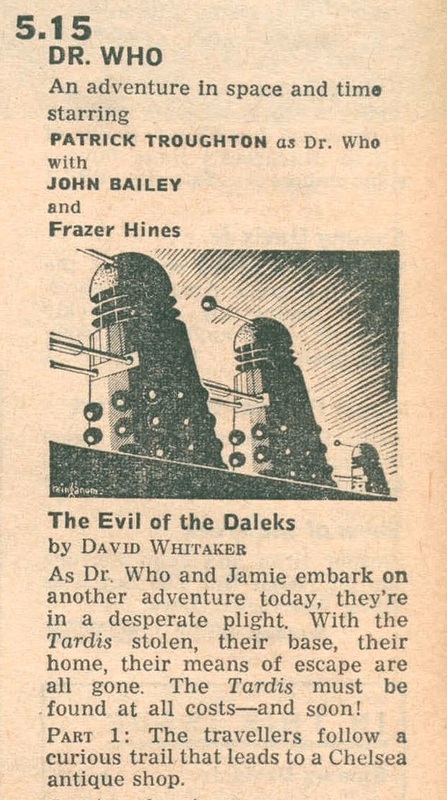 His writing Death To the Daleks as a riposte to Mr Whitaker’s The Power of the Daleks fell flat; arguably, he might have written Genesis of the Daleks as a comeback to this story, far more successfully, and Whitaker couldn’t have written that. I’m happy for different writers to be different. As for “The final end,” well, Nation did that in his first story, didn’t he? So Skaro’s blown up already, with more to come (it’s worse than Atlantis). It was inevitable once Nation said he was taking them away that the BBC would do something big, but that’s not the only reason – it’s happened again and again. Russell did the final destruction of the Daleks four times, didn’t he? Would you rather have Victoria, Kemel or her father surviving to go off with the Doctor and Jamie at the end? I’m strangely tempted to have Maxtible join the crew, though – he could wander round being charmingly patrician and exploring, then trying to nick everything, while everyone admires his enormous bouffant. It would be like Pertwee in the TARDIS a few years early. Or Beta the friendly Dalek – yes, Beta would be a good companion. Would you swap episode 2 of this story for another surviving Evil episode? Well, I’d like to see them all – Jamie awkward amid Paperback Writer and the “lassies”, even the slightly sagging middle ones for their visual impact, but any of Episodes 5, 6 or 7, especially, which are all spellbinding. Perhaps 6, counter-intuitively; we’ve got some of the footage of “The final end,” and while it’s better than it has any right to be, perhaps I’d rather see the Daleks’ strange playfulness amid the Victoriana and the Doctor’s big confrontation with the Emperor. I suppose the real answer has to be no, because I wouldn’t want to lose those marvellous scenes of the Doctor and Jamie creeping about and working it out, or the first sight of Maxtible’s magnificent beard, or most of all the whole gripping, dreamlike then nightmarish scene in the laboratory. Last week I wondered whether Whitaker's Daleks are a nightmare of nuclear fallout. This week's episodes made me question that slightly. But what do you think this story is about? The Evil of the Daleks is about as clear thematically as you get in Doctor Who – of course, it’s David Whitaker’s Faust. And whether he intended it with this story deliberately, or it arose naturally from his or the series’ views, it’s also as unambiguously Liberal as the show gets, as I’ve written on in my How Doctor Who Made Me A Liberal. This story raises the Daleks from a physical to a metaphysical threat – malevolent spirits that plot to seed all humanity with “The Dalek Factor”, taking even the Doctor for a ride. 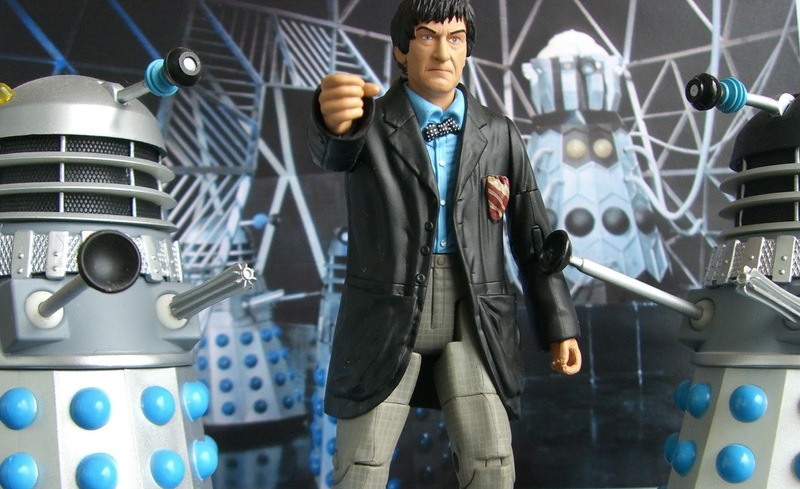 We see many transformations, with the ultimate conflict of our hero and the greatest villains each attempting to ‘turn’ the other, with alchemist Maxtible making this explicit as the Faust figure, though there’s temptation all the way through (and, as Dalek, he makes the devil as antichrist metaphor blatant, too, telling the Doctor to “Rise up and follow me”). Like Kennedy and Toby before him, Maxtible is overtaken by his greed – it’s almost ‘The Seven Deadly Sins of the Daleks: Avarice’, isn’t it? Mind you, both the Doctor and the Emperor are over-proud, Jamie is full of wrath (and fancies Victoria), Perry was envious and Terrall accused the Doctor of gluttony… You’d think in the seven episodes they’d have found time for Sloth. Or could they not be bothered? It’s difficult to think of a more strikingly Liberal allegory than defining what makes humans Human as asking awkward questions and making your own decisions, with the Doctor contrastingly identifying the core of “the Dalek Factor” as “to obey,” even before “to exterminate”. While from the first and in many subsequent stories the Daleks have been metaphors for the Nazis, here they are broadened to encompass all enemies of free thought who simply do as they’re told. And where the anti-racism of the first Dalek story was a bit let down by the ‘normal people = good, ugly monsters = bad,’ here the human Daleks aren’t monsters, but Maxtible is, and his becoming a Dalek just hammers the point home. In what ways has Doctor Who changed by the end of this story? 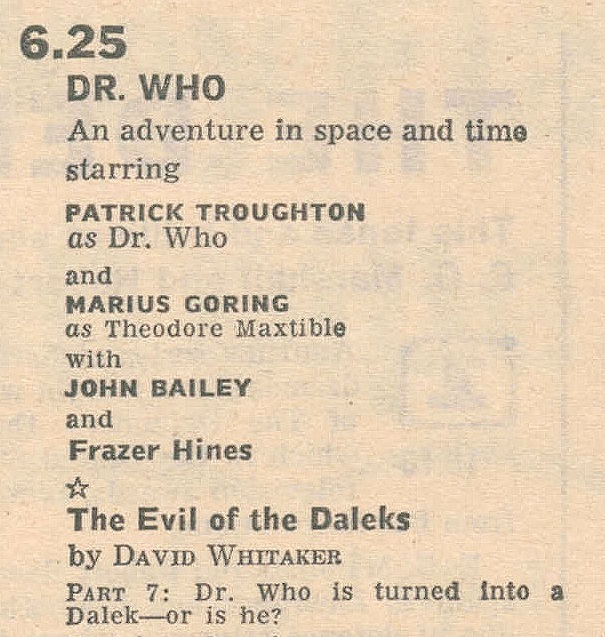 I’m not certain what you were after with “has Doctor Who changed by the end of this story?” The series, the character, and just within this story or since 1963? It’s certainly become more complex since then, with the Doctor here more palpably alien than he’s ever been (after developing that way in The Daleks’ Master Plan and The Tenth Planet), and more proactive (even starting as reactive in this story, he turns it around in a major way). For all that it introduces Victoria, it’s only in her fourth episode that she interacts with anyone or displays any character beyond ‘Wailing’ and ‘McGuffin’ – this is about Jamie, cementing him as this Doctor’s other half, not least when they fall out, and in the bigger picture, it introduces the idea of staging a story through different time periods as a thematic structure rather than random travelogue, arguably paving the way for but not a direct influence on the likes of Carnival of Monsters and City of Death (and certainly The War Games, much the same story if with a far bleaker view of human nature). At the time, it was establishing a more ruthless Doctor (a deliberate plan, rather than pretend bumbling) and clearing the decks of the Daleks, ready for new monsters, as well as, with The Macra Terror, pairing the peak of the series’ Liberal philosophy with mass destruction – well, freedom’s dangerous. This was the first purpose-built ‘season finale’, too, of which many more later – the first two seasons had ended with a triumphal scene, but here it’s the whole adventure. And, of course, if you’re asking about changes, much of this story’s about transformation, and yet it says that the Doctor is a transforming agent himself, a catalyst, and so can’t himself be changed. Which is lucky. If you could change one thing about the story, what would it be? Will the QI hooters go off if I say ‘The BBC to have kept all of it’? It’s tempting to truncate Episodes 3 and 4 into each other, but I don’t really want less of it, so coming in at Episode 5, that one’s gripping and fabulous but a couple of its ideas don’t quite deliver. Whitaker has a rare clumsy bit of writing in blowing Maxtible’s mesmerism within seconds of it being hinted at, which could do with a polish, but I think were I to change one thing it would be Arthur Terrall. His schizophrenic outbursts and, here, strange physical properties have been building to something, and then rather fizzle out. There are two possibilities that seem hinted at – that he’s an early attempt at the Dalek Factor, a failed experiment, which is why they have to call the Doctor in; or, more gruesomely (but what I was expecting the first time I heard it, when I was twenty and very much into existential crises), that he’s a Dalek android who doesn’t realise it, with his ‘real’ body that Ruth had fallen in love with long-dead. 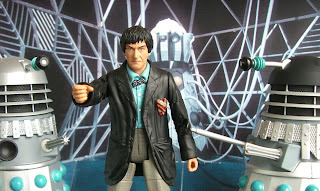 The control device and ‘get him away’ really aren’t good enough – his mystery deserves better, particularly after that terrific scene where the Doctor is flighty, enquiring, commanding, and generally winding Terrall up, with Troughton’s marvellous, mellifluously delivered line about his interest in all forms of life (contrasting directly with “There is only one form of life that matters – Dalek life”). Labels: Blogs, Daleks, Doctor Who, History, John Stuart Mill, Liberalism, Patrick Troughton, Pictures, Reviews, The Evil of the Daleks, Why Is Doctor Who Brilliant?